The sport of tennis is a complex game. The back-and-forth notion of the game leaves out certain strategies one can adopt, the shot placement and selection, and adapting to the different playing surfaces. Service technique is something we often bypass in defining the game, leaving more than meets the eye to the general enthusiast. Finding importance in selective movements, proper shot placement, and adhering to the surfaces can be a simple task. Research selections will point the user in the correct direction, leading to an increased knowledge base. One of the most important knowledge streams relates to the correct ball selection. Since this trait is adopted differently across the many different playing styles and surfaces, it becomes important to detail the aspects of the ball, types of travel, and matching up to the play component. Below is a comprehensive guide into the notion of tennis ball selection. We will introduce selective brands and types to give you a feel for which items would suit your game the best. We will also answer some of the burning questions that may puzzle tennis players in order to better inform the user of the correct ball type. Are Men's and Women's tennis balls different? What is the diameter of a tennis ball and how much does it weigh? What do the numbers on a tennis ball mean? How long do tennis balls last? What are tennis balls made of? How are tennis balls made? How do you know if the tennis ball has the correct amount of pressure? 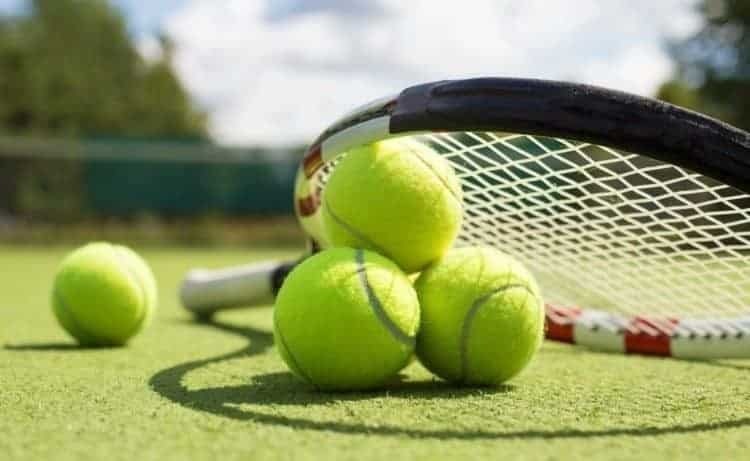 Why are tennis balls fuzzy? The brands we presented in the introduction will now meet with their sub-category. To review the products, we will narrow down the selection by categorizing 4 popular playing levels: beginner, intermediate, professional, and kid. By breaking down the playing styles, we can better allocate selections for the user. We will present 3 different ball options for each of these levels and will introduce a clear-cut favorite for each category in the conclusion. Let's get started with the top 3 options for the beginning level users. When it comes to beginner options, most wish to stay within a modest budget. This is exceedingly achieved with the Tourna brand. Tourna offers many different package sizes for their tennis balls. This 18-pack remains one of the cheapest options on the market. These Tourna balls come in the pressureless fashion, meaning they can take a beating and still maintain their shape and bounce. They are also equipped with an extra felt coating, making them a proper fit for any of the surfaces mentioned previously. This allows the practicing user to get their hits in on or against any surface. Most new users lack the access to a tennis court or a return partner, so the extra felt helps combat those back-and-forth hits against solid walls or garage doors. The Penn brand also competes in the pressureless space, marking for a second fitting option for the beginning user. The Penn brand has been synonymous with the game for many years, marking the brand as a popular source for tennis enthusiasts. The felt design is kept reinforced and designed with a smooth surface, allowing for a little more bounce and directional control than the average pressureless tennis balls. This collection comes with a large bucket for storage and keeps costs low and efficient to the pocket book. These models are generally used for practice, making them a main contributor to beginner success. Due to the smooth felt covering, this ball can withstand additional pressures admitted from adverse surfaces, making any canvas the proper area for you to perform your practice work. The last option for the beginner comes from a second popular brand in Wilson. Continuing the pressureless stream for the practicing beginner, Wilson offers many different packaging sizes with valued pricing. This 18-pack comes in a little higher on the price tag than the competitors, but Wilson is also known for their incredible attention to quality concerns. Their balls are all reinforced to the keep the shape, design, and function throughout an extended life span. The felt is made from recreational materials, making it the proper fit for any surface. This ball can withstand the pressures and abrasions caused by both smooth surfacing and rough terrain. These practice balls have a life time that far extends the competition. ​The intermediate space is for users who have gained a sense of the game and are working toward the competitive space. The first starter for this group comes from the Dunlop brand. The Grand Prix Hard Court model will begin to transform your game to the proper speed and ball type. These hard-court balls come with a loosened core and reinforcement with the felt. The felt is also shaded to a brighter color, allowing the user to have a better visual stream during the learning process to pace of play. The visual piece is important because it helps you develop the proper awareness and predictive streams needed to counter the opponent. The second introduction reverts to a brand that doesn't receive enough recognition in the tennis space: Babolat. Babolat works primarily in the developmental stages of tennis, meaning their production relates directly to practice ball options. Their 3-ball model comes in the orange and yellow patterning, keeping the visual piece as a primary benefactor to the consumer. These balls are pressurized and feature a heavy felt, allowing the pace of play to be slowed for the user. This helps the use develop the proper visual cues while creating well thought out predictive counters to the opposing user. This is a skill-based game and this skill set enhancer allows users to fine tune all components of their game. We end this intermediate discussion with the Wilson brand. One of the best sellers in the intermediate space is the Championship Extra Duty model. While the name may lead some to speculation of advanced play and a high-end price tag, this option remains relatively cheap when compared to other 3-ball can stylings. The extra duty nature means the ball is ready to take on adverse surfaces. Its reinforced cover keeps the outer shell from penetration, keeping the trapped air within the ball for full bounce performance. It comes in at the championship level, meaning the ball plays fast. This marks for one of the good mix-and-match options from the intermediate list because it completes some of the basic playing styles by testing the user's developed hand-eye coordination that the previous mentions developed. We now change the discussion to meet the needs of the practiced players that compete on a regular basis. As a good starting point for professional users, the money discussion becomes an afterthought. Most of these mentioned items reduce the look at the affordable price range to increase the production value needed at this level of play. These mentions will cater directly to the professional skill set. The first option comes down from the Penn brand. Their ATP Regular grade model comes at some of the highest recommendations and certifications on the market. The ATP is the Association of Tennis Professionals and they are a group that works directly with professional venues and partners. These balls have been relied on heavily during major tournament play, citing some of the most popular destinations in their recent history. This model is best suited for hard and clay surfaces. It plays a little fast for grass surfaces, reducing the production one can obtain from their applied techniques. It comes with an increased amount of visibility, with a mark of 19% increase reaching the top of the visual streams on the market. It is also made from professional grade felts and utilizes a complex core construction to ensure solid coverage throughout. Penn has been a player in the tennis space for many years making this professional outlet a great source to benefit the aspiring professional player. We stick with the Penn brand to introduce a practice model that suits that professional player. The Pro Penn series is an extension to their regular brand productions. This model is termed the Marathon Extra Duty ball. It is constructed to produce sound returns and contacts while still standing up to the test of time. It is covered with a LongPlay felt, a proprietary substance that Penn utilizes to keep the ball from caving in to pressures or long-term play. The core has also been completely redesigned to keep this long-lasting playing capability a staple for this model. It is also pressurized, which is a telling story for the practice model. It utilizes professional grade felt and it is the ball professionals with often utilize to practice with. Wilson also puts a lot of time and effort into their products to deserve a mention at the professional level. Their U.S. Open High Altitude model is a unique development that many of us don't often consider. There are many different affects and pressures placed on a ball during course of travel, so it is no wonder that altitude can play a major shift to your style of play. This ball is made and suited for play at high altitude locations. It is constructed at a technical basis, putting the correct amount of pressure within the ball and introducing the correct reinforcements to ensure it can handle the air pressures at these height levels. It is officially endorsed by the U.S. Open and it is the same ball they have used in this tournament for nearly 40 years. Practicing with a high-altitude model is also a good idea for those who are traveling for tournaments. Most professional venues feature higher altitude play, making this a perfect pairing to improve upon your versatile game play. When it comes to forwarding options for the kids, it is good to start out in the basic space. Most major retailers and sporting good companies will offer a large collection of tennis balls for a low price. These collections are known as refurbished models. While these models are essentially used, they are taken to a facility to revitalize some of the components that add to a proper bounce and the correct striking ability. These options often suit the early-stage user best because they are the cheapest way to obtain some of the top name brands in tennis. Much like refurbished golf balls, refurbished tennis balls will extend from popular sources such as Wilson, Penn, Dunlop, and others. To the user's surprise, there may also be some expensive inclusions based off of misspellings during printing or other such minor defects. This is the proper starting kit for a kid because it keeps your initial investment low and it doesn't create any confusion as to what will work for them. If they are in the beginning stages of play, each ball is relatively the same to the other in their eyes. Their unpolished game will not be able to counter the skill developments that are needed for proper operation, keeping basic skills at the center of the discussion at these early stages. Penn is a very popular producer when it comes to catering to the new generation of tennis players. Their QST 36 model meshes a pattern between yellow and red coloring, keeping a visually appealing model for the intrigued user. The low compression core keeps the overall speed of the ball slowed and paced. This allows for enough reaction time from the user, which is something that the child when work on with their initial training sessions. The color combination works well for the visual stream, creating a moving object that is easily seen and tracked by the user. Heavy felt is also utilized to keep this ball bouncing at peak levels throughout the span of a long-term life. It is built for hard and rough surfaces, keeping any terrain as the popular playground for these beginning players. The last beginning builder extends from a brand we have yet to mention within our discussion: Gamma. Gamma has created a foam option that comes in as the cheapest price per unit on the market. These items are much softer than a tennis ball and much more light weight. They still bounce relatively similar, although they do die down quicker due to not having the same hallow core as a tennis ball does. They make for great developers to speed management and managing your striking. This allows you to get a feel for contacts and which ones would suit the correct shots. They are also for easier for the kid to use and won't physically wear on the child like a tennis ball would if practiced for long periods of time. 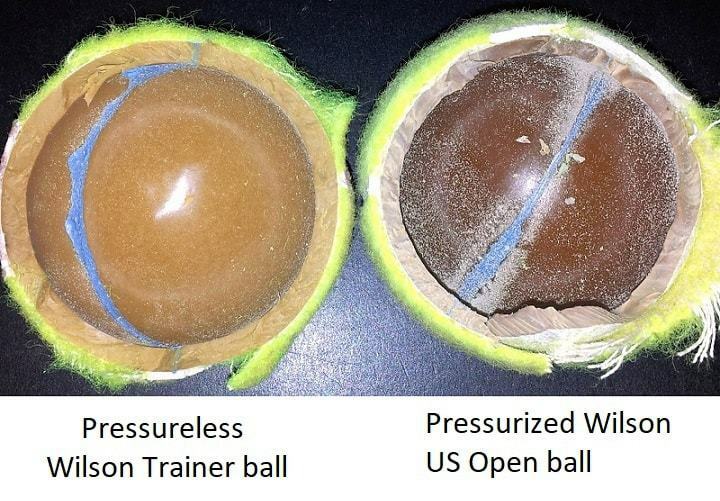 The difference between pressurized and pressureless tennis balls is one of the many discrepancies that tennis balls can host. Below we'll introduce some additional details and describe where these differences meet the different playing styles and skill sets the individual hosts. After addressing the main differences between these two ball types, it is important to also touch on the different skill sets these balls would suit best. The pressurized balls have a shorter lifespan, but they are the chosen selection for match play. This means they will be the main contributor to ready competition. Casual players and individuals who are building their skill sets should opt for the pressureless models. The avid player and competitor should practice most often with the pressurized balls to give themselves the proper feel for contact, managing spin, and perfecting the drop shot. For example, if you are a player that is competing in tournaments and matches on a weekly basis, you are going to want to practice at game speed. The pressurized models suit this style the best due to the fact that they are the same models featured in match play. If you are a player that is only competing on a monthly basis, start with the pressureless model to build your skill set. Once the competition nears, switch over to the models used in live play settings. Sticking with the pressurized versus pressureless discussion, the forms of contact and reactions the ball has to the racquet with also differ. The pressureless balls have a harder surface and weigh more than pressurized balls. Practicing with these balls is a good show for managing the proper contact force and finding the correct direction in your shot. Since these balls are harder, they offer little give and won't bounce as much as the pressurized balls. These are the perfect representative for the user needing to practice drawn out volleys. 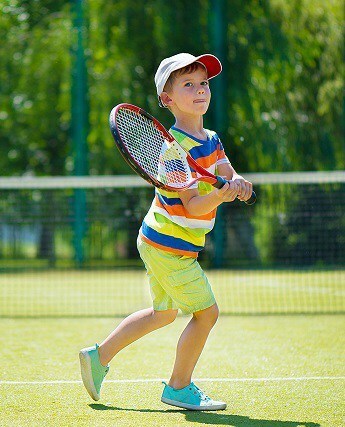 This back-and-forth play is a developmental skill that is taught early in the game, making these pressureless models the perfect fit for the beginner or the youngster wielding a racquet for the first time. The pressurized models suit the refined game more than they do the early learning strategies. These balls have a higher correlation of benefit in spinning and drop shot techniques. They are much lighter than pressureless models and offer more bounce. They call for the user to have adapted proper wrist controls and swinging styles in order to perform these different types of shots. These types suit the intermediate to professional player and often work best to continue development after the early learning stages. The felt make up of the ball also plays a role in the selection process. The extra duty ball has a loosened felt make up, which reduces pressure build-up at the core of the ball. The outer shell of the extra duty ball holds a thicker felt pattern, allowing it to stand up to adverse surfacing. This model is best suited for the hard-court surface. The hard-court surface represents a very stable moving surface for the user, but it can damage balls in quick fashion. The biggest takeaway to the ball during hard-court play is the wear and tear on the felt. Models that feature little reinforcement in this space will often tear at the ball and can cause damage to the core. These reinforced models severely limit these attacks and can keep your ball operating at full function throughout the course of a match. The regular duty balls are lighter and feature limited reinforcement measures at the external covering. The draw to these balls is their ability to tighten the core and kept the internal working of the ball intact. The clay surface is rather smooth, but it can have different layout patterns than the flat, hard-court option. The differing layouts and construction of the court can often cause problems with correct bounce and landing. This is where the regular duty balls come into play. Their redesigned cores help to adjust for these surface changes, keeping the path and bounce of your ball stable and consistent. We have already addressed two of the popular court surfaces is hard courts and clay courts. The last popular option is grass surfacing. Grass surface courts play rather slow, due to the abrasion the grass puts on the ball each time it is to bounce. This keeps bouncing at low heights and can often lead to the use of the drop shots or quick returns that keep the flight path of the ball lower to the ground. A durable ball makes for a fitting use on this court, leaving the extra duty balls as the most popular choice for this surface. The grass surface would also benefit from a ball that is pressurized due to the trade off that exists between the ball's ability to bounce. This keeps the bounce in the ball and cancels out the rather rough surface that grass emits. The pressureless ball would represent a bad fit for the grass surface due to it's already narrowed height in bounce. It plays low to the surface and the grass has properties that create additional low heights, causing the two to be a bad fit for one another. After introducing the top 3 options for each playing level, it is time to introduce the clear-cut favorites at every position. Starting with the beginning units, it is most common to go with volume over quality. This leaves Tourna in the top spot. Each of these pressureless mentions marks for the proper fit for the beginning user, but you get the most bang for your buck with the Tourna brand. Their collection of pack amounts is competitively priced well below the other mentioned brands. When it comes to intermediate play, the Wilson Championship Extra Duty model is the clear favorite. This model features use amongst the biggest stages in professional tennis, without carrying the price tag that is associated with these high-end events. It is extra duty in nature, meaning it is built to stand up to any surfaces you present it with. It is a great fit for the practicing user that is ready to advance on to match and tournament play. When it comes to the professional ranks, Wilson takes the cake once again with their U.S. Open High Altitude model. This model is the official ball type that has been utilized at the U.S. Open for over 40 years. Taking attention to high altitudes, this ball has a core that is uniquely designed and makes it stand out in the professional marketplace. This is the perfect proponent to keep your game as versatile as possible. It will also prepare you for all forms of competition when mixed-and-matched with previously Wilson models. When it comes to the kid's discussion, there is a real toss up when it comes to picking a winner. If there are ready for live play with balls, go the refurbished route. If they are just starting out and learning to swing, Gamma's foam models mark for the top option. The discussion really sets it back to where the user is starting from. After discussing all of these brands and ball types, it is important to revert to some of the main contributors to different ball types. Before playing on the court, know your surface. Understand the speeds your court emits or understand the hindrances placed on your pace. Ensure before you purchase by locating the ball type. Is it pressurized or pressureless? It is an extra duty build or a regular duty build? Are there forces at work within the core that you should know about? Your developed research tools can make all the difference when it comes to making the proper selection for your skill set. While we were able to touch on most of the important aspects surrounding tennis balls, some areas lack the details needed for the buyer. Below is a list of common questions with in-depth responses as counters. These questions were formulated to ensure they touch on all the important aspects of the tennis ball and tennis ball types. The tennis ball is often tiered in levels to better help address the quality of the ball for the user. For example, the Professional and Championship levels are much better quality than the Recreational levels. The professional level is the highest tier, which leads to the highest price tag. These balls are meticulously tested and refined to ensure the makeup withstands anything from common blows to adverse surfaces. These balls will often introduce differing textures and patterns to ensure the flight, spin, and drop are never compromised for the user. The championship level operates in a similar fashion. Championship level balls are the perfect mid-range option for match playing users. They will introduce features in the core or with the felt makeup, reducing the amount of wear and tear balls can face. The recreational level is the base level of tennis balls. These balls are often pressureless in nature and are most often utilized in the practice field. These balls are most commonly used in tennis ball machines due to their ability to withstand many blows. When it comes to competition at the amateur level, men and women will compete with the same balls. Pressurized balls are utilized in match play at all the lower levels of competition. When you reach the greater echelon of players and competitions, the ball types will start to differ. At the professional level, the biggest difference between competition ball use is the felt makeup. This relates directly to the use of an extra duty ball or a regular duty ball. Men's professional matches will use the extra duty felt option, while women will compete using the regular duty felt model. This difference also extends to the tournament type. For example, the balls used at Wimbledon will be different than the balls used at the Australian Open. This item is usually set aside for the digression of the surface type and the magnitude of the tournament of play. The mass of a tennis ball will range anywhere from 2.5 inches to 2.7 inches. The weight of a tennis ball cannot exceed 2.1 ounces and the lowest weight supported by match play is 1.8 ounces. Having those facts stated, it is important to note that there are models that extend beyond these requirements. Most of the extended models are primarily used in practice play. For example, heavier balls help benefit the duration of play for a user due to pounding around that additional weight for hours and hours. Heavier balls are used as a training assistant and can help a user strengthen their game. It is common practice for users to train with weighted balls and proceed to alter to a regulation ball to help with stamina and building a solid control foundation. The numbers on a tennis ball do not hold meaning beyond the type of court surface they are suited for. The range usually extends from 1 to 3, which helps user understand which court surface they work best for. The number 1 is used for slower surfaces, such as grass and clay. The number 2 is used at medium-paced play, with clay being cited as the preferred surface of use. The number 3 is for faster play and it suits the hard-court option the best. Any numbers beyond this range are used as simple indicators for your ball, much like golf balls at the golf range. Most tennis balls can last up to a few months. If using a tennis ball for practice play, the lifespan of the ball will go up due to your ability to adjust to the wear and tear. Pressureless tennis balls will last the longest due to their hard, reinforced exterior. 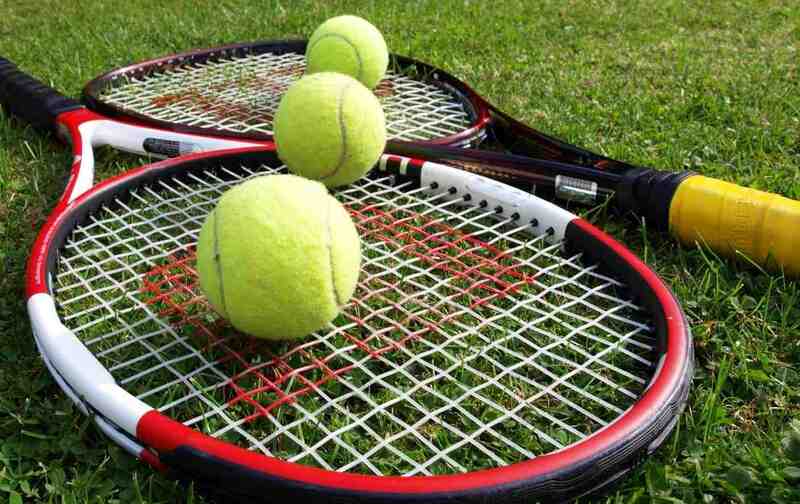 Pressurized tennis balls that are used in match play will usually only last for a few weeks. A simple drop test while recording bounce height will indicate whether or not you need to replace your tennis balls. The tennis ball starts as a hollow, rubber sphere. This rubber is fused together to ensure that some amount of air is trapped within the sphere. The outer shell is made up of nylon, wool, and felt materials. The rubber is once again utilized to produce the thin lines that cover the tennis ball. Some tennis balls with be lined with shock absorbent technology or other such features, but the basic tennis ball is made up of the materials mentioned. Most of the raw rubber content that make up tennis balls are imported from countries across the world. Once the rubber is obtained, it is shaped and molded as a half shell. The two halves are than fused together. Once the ball is allowed time to fuse properly and completely, the felt and wool are wrapped around the shell. Small adhesives placed all over the shell keep the felt from falling off. Balls are often polished and cut to keep the proper spherical shape. Most balls are made via heavy machinery, a process that has evolved over the years, allowing companies to pump out hundreds of balls in a matter of minutes. Since the air-tight seal is applied during the building process, far before the balls reach the consumer, adjusting this process is not a simple fix. Most people will recycle tennis balls for additional uses and many of these improvising techniques can be found scattered on the internet. The first test to apply is a bounce test. Simply drop two balls, at the same height, to the ground. Make sure you use a new ball to counter the old ball. If the bounce height is relatively similar, the balls have the correct amount of pressure. The bounce will be noticeably lower in a low-pressure ball, calling for a replacement. The user can also use an applied force and squeeze test to the ball. If you are able to apply enough pressure to cave in the rubber core or if you notice a lot of give from the core when clenched in your palm, it is time for a replacement because these balls are low on pressure. The fuzz plays an essential role to the game of tennis. Without fuzz, the tennis ball would have the same properties as a bouncy ball. It would bounce at different heights and would take a strong force to slow the speed of the item. The fuzz helps deter the properties of any given surface, slowing the speed of the ball and the bounce of the ball. Without the fuzz, the user would not be able to apply the practiced spinning and drop shot techniques.